The Japan Foundation invites academics and researchers in the area of Japanese studies to study in Japan. The guest contributor for this issue is Koon Fung (Benny) Tong, a 2016 Japanese Studies Fellow who researched "Negotiating Old Age through Music: Understanding the Japanese Popular Music Genre 'ENKA' as Aging Practice and Discourse" at the Graduate School of Letters, Osaka University as a fellow writing his doctoral thesis. I first encountered the popular music of Japan in 2000 when I was a secondary school student. While still living in Singapore, I became attracted to the J-Pop and J-Rock genres, including Ayumi Hamasaki and LUNA SEA. Drawn by my interest in the music, I later entered the Department of Japanese Studies at the National University of Singapore. My subsequent decision to engage in academic research on Japanese popular music was triggered by the debut song "Umiyuki," ["Ocean Snow"] released in 2008, by an American born enka (popular Japanese melodramatic ballads) singer Jero, who has a Japanese grandmother. In my bachelor's thesis, I used the example of Jero's enka performance to describe how the popular belief that "enka is the heart and soul of the Japanese people" was in fact constructed by the marketing of the music industry and the arguments of the critics. However, I still did not have an answer to the question of how enka listeners actually enjoyed the songs. To answer this question, I spent four months engaged in participant observation* at karaoke café S in Asaka City, Saitama Prefecture in the spring of 2013. 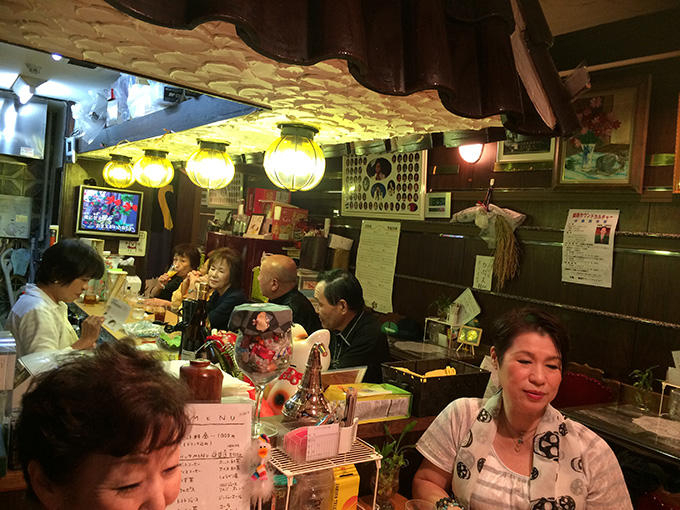 While the elderly customers who gathered there mostly sang only enka and other old-fashioned popular songs called kayōkyoku, their regular visits to the karaoke cafe were something they looked forward to, as here they could socialize and keep fit physically and mentally. The customers drank alcohol and tea, ate snacks, and sang karaoke songs, as they interacted with others who liked similar songs. That exchange even developed into intense emotional interaction on occasion. For example, I observed several occasions in which a particular 65 year old widow, who was attracted to the strong singing voice and kindness of a certain 80 year old male customer, flirted with him openly. 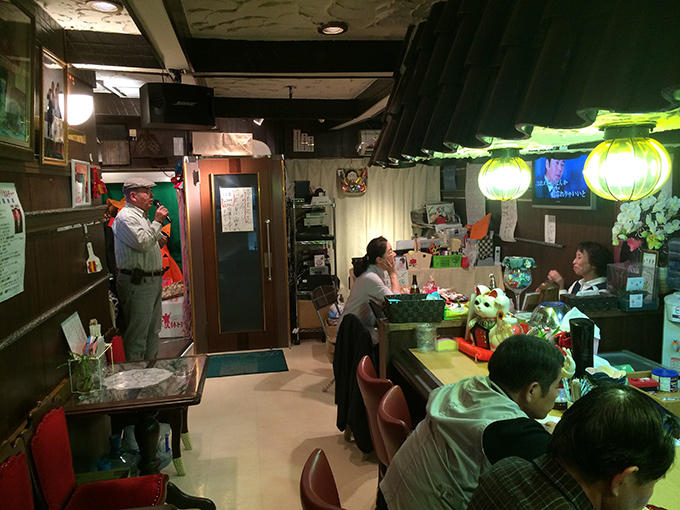 Impressed by the vigor of the elderly customers at the karaoke café S, the focus of my research shifted to the activities and sentiments of elderly karaoke enthusiasts. While this was a subject that has seldom been researched, in recent years, increasing attention has been paid to the issues of aging as part of research in popular music, influenced by sociology and cultural anthropology. Under the Japan Foundation's Fellowship program, I was given the opportunity to be affiliated to the Musicology and Theatre Studies department of the Graduate School of Letters, Osaka University from February 2016 through January 2017, to work on my doctoral thesis that will be submitted at the Australian National University. During that time, I primarily carried out participant observation and interviews regarding the musical experiences of elderly karaoke enthusiasts in Osaka. I chose Osaka as a fieldsite this time to compare the karaoke cafe culture of the Kansai region with that of the Kanto region. However, although there are differences in dialects and in the personal backgrounds of the customers who visit karaoke cafes in Kansai and Kanto, I found that, fundamentally, there was much more in common in their relationships to the songs and the nature of their interpersonal relationships than I had expected. Specifically, I observed the development of emotional connections between men and women through karaoke at karaoke cafe A in Sumiyoshi Ward, Osaka. T, a 74 year old man, and M, a woman of the same age, were long time regulars at karaoke cafe A. Both of them had families, but had lost their spouses, and would often sing songs that their spouses had liked. The two had become attracted to each other through singing and conversing, and would often flirt with each other when they were together at the cafe. For example, one day when T sang "Hoshikage no Warutsu" [Starlight Waltz] by Masao Sen, he faced M sitting next to him and spoke into the microphone saying, "I dedicate this song to M," using an affectionate form of her name. M frequently gazed at him adoringly and clearly listened with great attraction as he sang in a husky voice, applauding at the end of his performances. In other words, T and M were able to recall their feelings for their late spouses, while at the same time reliving together some of the excitement of the love that they had lost. This manner of using karaoke to reflect on one's life while creating ways to enjoy the present and future was deeply fascinating to me. While visiting these karaoke cafes, I also became aware of karaoke singing classes, where karaoke became something to learn rather than simply enjoy. One interesting teaching method I observed during a lesson at class C, also in Sumiyoshi Ward, was the act of repeatedly practicing a song while wearing a belt tightly around the stomach. The instructor explained, in comparison to younger people, that "at this age, if we don't teach our body the techniques and rhythm of using their stomach strength, we won't be able to keep up with the musical accompaniment." The genres of the songs taught at the lessons are typically the latest enka and kayōkyoku songs, written in consideration that they would be sung in karaoke, rather than deeply familiar songs from the past. According to the instructor, this was what the students wanted, as they always looked forward to learning the latest songs. One student, K, also expressed this forward-looking approach to learning songs, explaining that "I don't really have any particular favorite songs because whenever I learn a new song, I forget one of the old ones." Perhaps the reason that the situation of the elderly, who continue to love enka and kayōkyoku, has been ignored is because academic research and the media have simply seen these genres as "oldies" from the past, as expressed in the sentiment that "enka is the heart and soul of the Japanese people." My research aims to clarify the purpose of enka and kayōkyoku for the physical health and emotions of individuals, and for social relations between individuals, in order to demonstrate a more positive side of elderly life seen through karaoke. *Participant observation: This is a form of qualitative social research in which the participant observer resides in the community that is the subject of the research for several months or years to live as a member of that community while carrying out direct observation and carrying out interviews regarding life in that community. 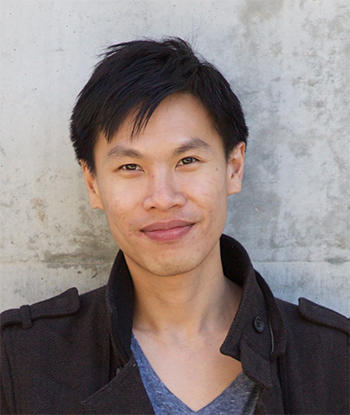 Koon Fung (Benny) Tong is a PhD candidate at the School of Culture, History and Language, at the Australian National University. He loves karaoke, and became captivated by the popular music of Japan as a secondary school student. For his doctoral thesis, he is studying the purpose of enka and kayōkyoku for elderly participants in activities at karaoke cafes and singing classes in Tokyo and Osaka, to gain a deeper understanding of the conditions of their elderly lives. His latest publication in English is an academic paper contributed to Situations: Cultural Studies in the Asian Context (Vol. 8, No. 1, 2015).